Home » Blogs » Charles Gaba's blog » Case study in why HC.gov's Rate Review tool CANNOT BE USED to figure statewide rate increase averages! When you look at the overall average increase when weighted by relative market share for each company, it's either 5.4% if the data provided by the state insurance commissioner has already been weighted, or 6.1% if it hasn't. Yes, that's right: It appears to be an "average" 18.44% rate increase request...over 3x the actual average. Even if you weight this by market share and assume that practically every WA enrollee is using the Premera Multistate Silver plan (10.39%), that'd still make it look like nearly 2x the actual average increase request. OLYMPIA, Wash. – Seventeen health insurers filed 246 individual health plans for 2016 both inside and outside the Exchange, Washington Healthplanfinder, with an average requested rate change of 5.4 percent. 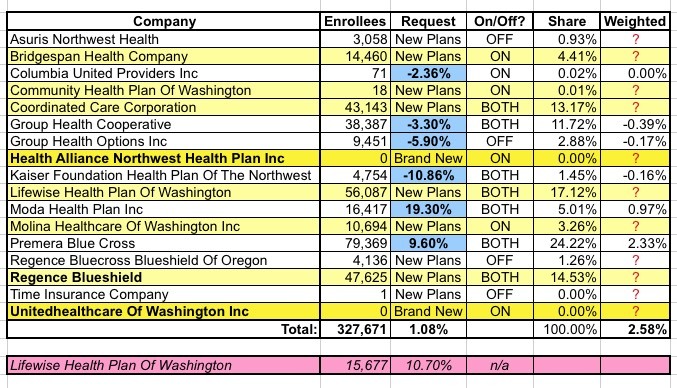 Thirteen of the 17 insurers filed 188 individual health plans for sale inside the Exchange, Washington Healthplanfinder. If all are approved, the number of Exchange plans would increase from 90 to 188. Currently, there are 10 insurers participating in the Exchange. Yes, that's right: 17 insurance companies total...yet only 3 of them are listed on the Rate Review site. 82% of the companies (14/17) have rate requests lower than 10%, yet aren't even listed. When you look at the actual plans included it's even worse. 246 plans in all...yet only eight are listed at all (possibly as many as 13...Time Insurance appears to be lumping all 5 tiers--Bronze/Silver/Gold/Platinum/Catastrophic--into a single listing). That means 97% of the plans available in Washington State are seeking increases lower than 10% next year. To reiterate: The Rate Review tool is handy for finding particular requests for particular plans from particular companies...but is completely useless for trying to figure out the overall requested rate changes in any particular state (unless every plan from every company happens to be listed for that state, which seems to be pretty rare).